I was sorting through old photographs when I ran across this one. She always did love going for rides with pog. If you’ll excuse me, I think I have something in my eye. Ysabell was laid to rest tonight, under the oak tree in our backyard. 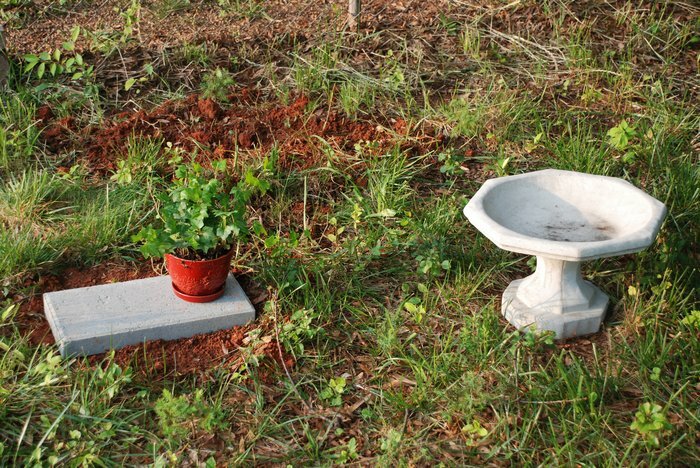 Meabh got her a small stone slab and bird bath, and a plant to sit near her. 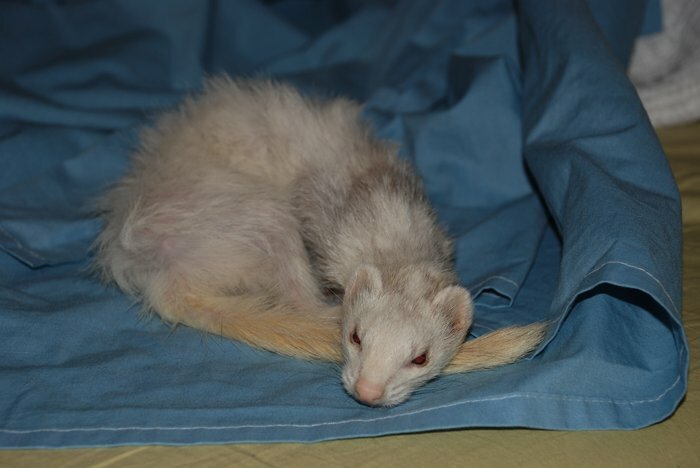 She was buried in one of our old tshirts (lets face it, 90% of the ferret’s bedding consists of our old and sometimes not-so-old clothing), with her favorite red kong and a piece of cardboard she’d holepunched back when she was feeling better. Meabh and pogle would like to thank everyone for their kind words. We’ve had phonecalls and text messages, emails and IMs, and posts here on the Chubby Ferret from friends, families, and web readers alike. 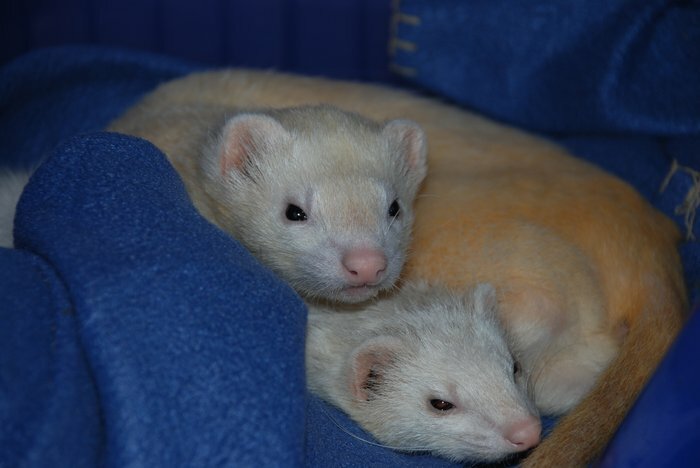 We appreciate you visiting us and sharing our ferrets’ lives through our photos and videos, even through the rough times like these. Ysabell had a ruptured mass in her intestines, where the duodenum meets the jejunum. Given the appearance of the intestinal lymphatic tissue (nodular) and the abdominal lymph nodes (enlarged), I am guessing the mass was lymphoma. 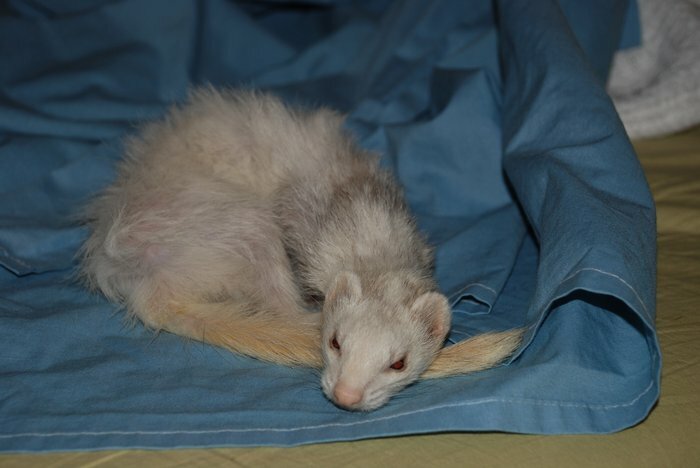 She had a large amount of fluid in her belly, which was a reaction to the leaked intestinal contents (septic peritonitis). This is an event that happens very rapidly and has a poor prognosis. Sure, we may have been able to surgically remove the mass, but if it was lymphoma then intestinal lymphoma has a poor prognosis and requires chemotherapy to have much of a chance after surgery…I sutured up her incision, curled her up inside a pad, and placed her back in her box with her shirt and toy…May she rest in peace. In the end, the ‘nastydonotwanttotakethese’ meds helped her for a while, but the root problem was beyond solving. By the time her symptoms became pronounced, she was far too weak to have stood much of a chance at something as difficult as surgery followed by chemotherapy. We’re just thankful that we got the time that we did with her, and even when she was declining that we spent extra special time carrying her around, letting her see and smell things that she no longer had the energy to interact with on her own. Once again thank you to everyone, and in the future we look forward to sharing more times with you all: happy (lots! ), funny (beyond count), and sometimes, when all else fails, sad. As we’ve been indicating in the blog, Ysabell has been unwell for some time. 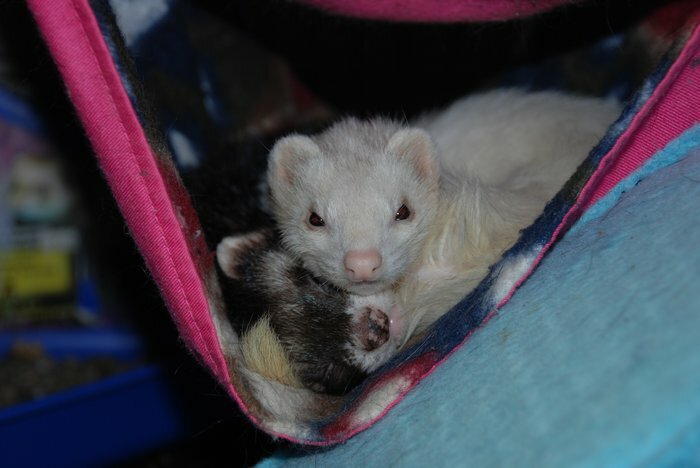 After a rough weekend where we couldn’t get Ysabell to eat, pogle came home from work to find she had passed away in her sleep. Minsc was curled up on top of her, keeping her warm even as she left us. The introduction of Minsc into her life thoroughly upset Ysabell, although I think at least part of it had to do with the onset of her illness (even though we didn’t know this at the time). Towards the end, we’d occasionally hear Minsc’s loud complaints regarding her, but it had become less of a “Mom, she’s trying to kill me!” issue and more of a “Mom, Ysabell kicked me out of the bed!” issue. And oh my, did she love to steal his warm spots, especially if he had been snuggling with Jack Jack. She was very proprietary of JJ, her lifelong friend. Being the elder (and the adrenal one), I think his surviving her has surprised all of us, possibly even him. 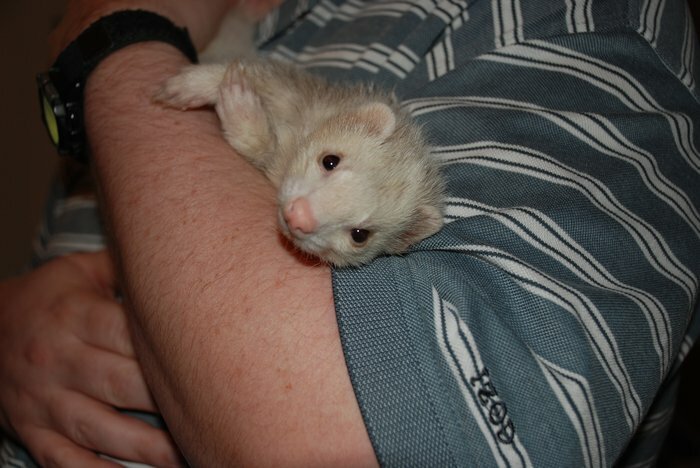 It’s hard, with ferrets, to know when they’re not feeling well. For Ysabell it seemed to start with Minsc, and then suddenly she wasn’t hole-punching cardboard, stashing the kong, or playing during playtime. Logic tells me that these things slowly added up, but both pogle and I cannot help but feel her loss as sudden. She’ll be laid to rest with her favorite Kong toy, that she loved to stash so much (and was positively frantic if she couldn’t find; no worries there anymore sweetie), and with a piece of cardboard, in memory of all that she has chomped on while bringing so much joy to our lives. We’ll miss you Ys. Or at least that’s what it looked like as his undercoat grew in. Such a yellow boy. She’s lost 2 ounces for no reason that we can determine and feels like a bag of bones when we pick her up. She goes to see the vet with JJ tomorrow. JJ is reacting wonderfully to the Lupron shots: he’s regrown all of his hair but that on his tail, and even that is beginning to peach fuzz. 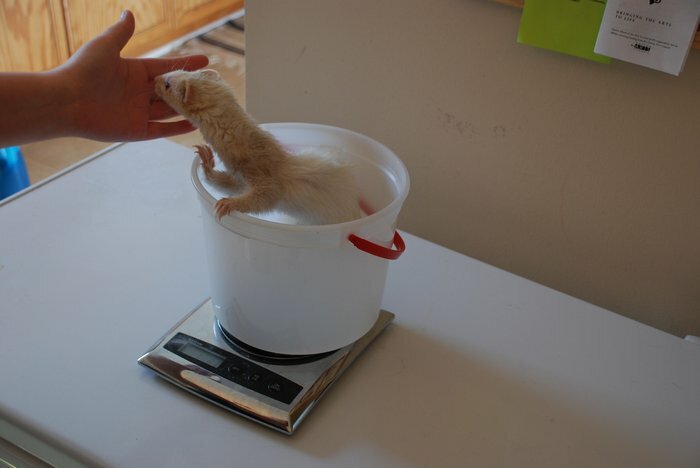 The kitchen scale + bucket is about the only way to get a ferret to sit still long enough for you to weigh them. Ysabell didn’t kill Minsc last night. 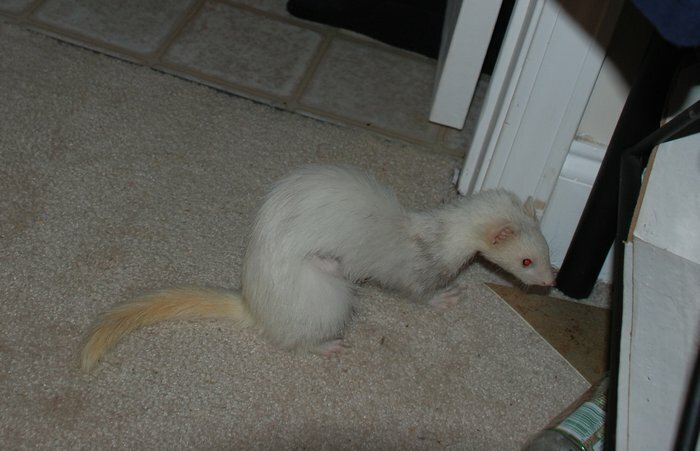 We’ve been taking our time socializing the ferrets, letting the older ferrets get used to Squirt. Minsc has his own cage (our one story, folding travel cage) that he lives in alone (with occasional visits from JJ). A few times we’ve put Minsc in the big cage to try and get them all used to living there together (and to spread his smell around it, making him one of the gang). They get shared playtime, however, both in the playroom itself and in the close quarters of the playpen if it’s my morning off work. Turns out JJ loves to wrestle with Minsc (who mostly just runs away), Minion thinks he’s fun too (Minsc will wrestle with him more than JJ), and Ysabell hates his guts (Minsc squaks like he’s dying the minute she gets near him). She’s slowly coming out of it, but for the past few weeks she’d approach Minsc, groom him a bit, then latch onto his neck and SHAKE. This would naturally result in lots of squealing from Minsc. I spent a good 10 minutes one day just watching them and yelling “YSABELL!” whenever she got near his neck. I’ll tell you one thing: she knows her freaking name, that’s for sure. Everytime, she’d stop and look at me. Maybe shuffle a few steps back. And watch. After a few moments she’d start stretching her neck out to Minsc, which would get her scolded again. 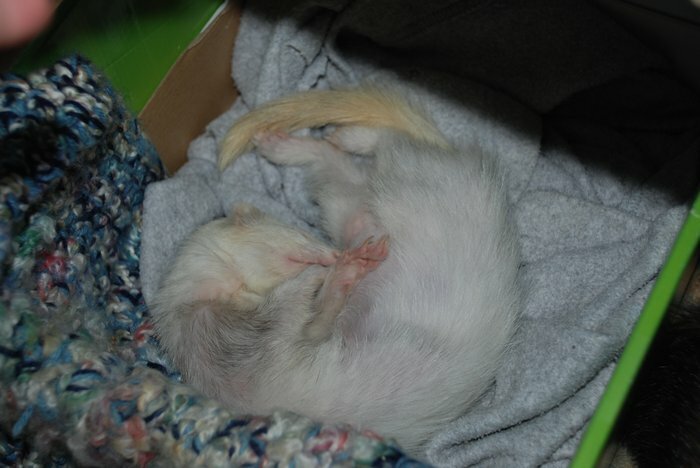 After that little training session she’s been doing better, enough so that we let Minsc sleep in the big cage last night (I’m a light sleeper when it comes to the ferrets, and could be awake and running in less than a minute). I didn’t hear a peep, even when I woke up with insomnia at 5AM. Pog says there was some squaking earlier today, but for the most part it’s been quiet. This could mean several things: Ysabell is in a good mood today, Minsc is learning not to use the baby squak, or Misnc is getting really good at tiptoeing around Ysabell. My money is on #3, seeing as I got to watch him tiptoeing earlier tonight. Ysabell stole his bed while he was in the litter bin, and he had to walk by the bed to get to the ramp up. He very quietly got out of the litter and, with his body low to the ground, started slowly walking toward the ramp. All the time he was as quiet as a mouse and stayed out of her sight range. Smart little thing. He may just survive kit-hood with this bunch after all. Minsc (aka Squirt aka Blaze) came to us from a couple who dearly loved him, but didn’t have the time available to give him the attention they felt he deserved. He will be well loved (and well sniffed) in his new home! It snowed (twice!) 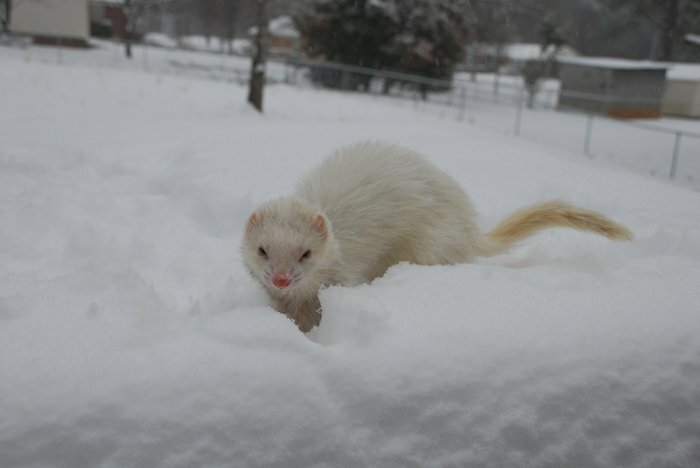 here in NC this winter, so naturally we stuck the ferrets out in it. Ysabell…was not pleased. This is, of course, just a teaser for the new photos we have coming up! I know you all suffered through a ferret-less February, so to make up for it expect some very cute and surprising pictures in March!